Injury to the peroneal tendons is one of the most common reasons for chronic outer ankle pain following a sprain. The peroneal tendons are two bands of tissue that connect muscle to bone along the outer ankle. 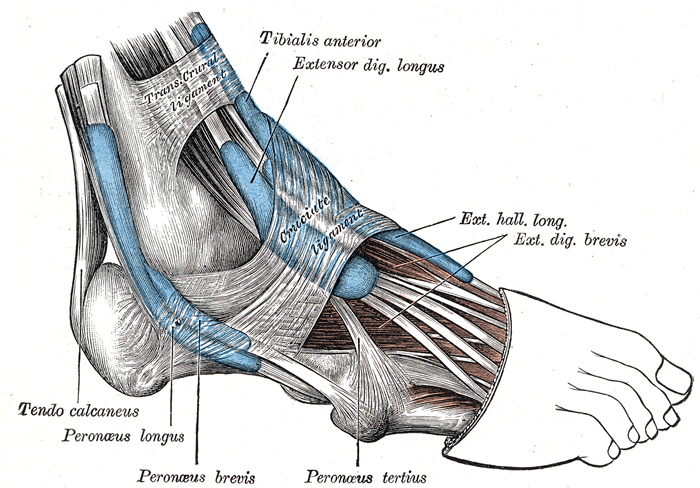 One peroneal tendon connects to the outer midfoot; the other tendon runs under the foot and attaches along the inner arch. These tendons stabilize the foot and ankle, protecting you from sprains. However, when a sprain occurs, these tendons can receive too much stress, resulting in chronic pain. Peroneal tendinitis: Symptoms include pain behind the lateral malleolus along the outer ankle. Swelling and tenderness are also present. Often, symptoms arise when the patient returns to activity after taking some time off. Sometimes patients wake up with this injury and think they’ve sprained their ankle. Peroneal tendon subluxation: Patients feel a snapping sensation over the lateral ankle. Weakness and pain are also present. Pain is worst while cutting laterally across the playing field or toe walking. Peroneal tendon tears: Pain and swelling along the outer part of the ankle are present. Pain and weakness are especially pronounced when pushing down with the ball of the foot or turning the foot inward. The outer ankle will be tender and warm to the touch, swollen, and possibly red or bruised. Anomalous peroneus brevis muscle injury: Debilitating pain occurs along the prominent bony part of the outer ankle, and is especially worse during the push-off portion of gait or when the patient tries to turn the foot outward. These injuries usually occur due to a sudden twisting of the foot during sports play. Lateral ankle impingement: This injury most commonly occurs during ankle sprain recovery. Patients may have been feeling good for a few weeks after a sprain but then suffer a sudden increase in pain and swelling without any obvious reason. Pain occurs when bearing weight, but the pain can be inconsistent. Often, pain is more pronounced after long sedentary periods or upon waking and improves over time. The pain can be along the lateral malleolus or at the anterior talofibular ligament. Are You at Risk for Peroneal Tendon Injuries? You’ve had a sudden increase in activity after taking time off. You participate in sports that involve repetitive ankle motion like basketball or soccer. You wear orthotics that haven’t been evaluated in a while. You run or play sports on uneven surfaces. Your feet have high arches. You have an abnormal foot alignment called a hindfoot varus. You May Also Like: Take the Edge Off Your Foot Pain with Peroneal Tendonitis Treatment! Rest: A minimum of 2-3 weeks is necessary, but expect to take 3-4 weeks before resuming activities like running. Swimming and biking are good ways to stay in shape once the initial swelling goes down. Ice: Place an ice wrap on the ankle for 10-15 minutes every two hours as needed for pain and swelling. Compression: Wearing a compression wrap can reduce inflammation further. Elevation: Keep your feet propped above heart level as often as you can. Medication: You can also take anti-inflammatory medication like NSAIDs for pain and swelling reduction. Diagnosis: We must first be sure that there are no fractures, so we’ll usually take an x-ray after conducting our usual assessment, touching various parts of the ankle to pinpoint the epicenter of pain. Pain: If the pain is severe, we can give you a cortisone shot. Advanced pain therapies like ultrasound, therapeutic laser, platelet rich plasma injections, and shockwave therapy can be found in our sports medicine centers as well. Offloading: If a natural abnormality in foot structure contributed to the problem, we can fit you with a pair of custom orthotics. Often, casting or bracing is necessary to ensure that you do not put too much strain on the recovering tissues. Correction: We employ board-certified podiatric surgeons with over a decade of experience to correct the most severe injuries. Mobility: Physical therapy is particularly pertinent for chronic cases of peroneal tendon pain. Prevention: We’ll send you home with a regimen of helpful stretches to strengthen areas of weakness and protect range of motion. “Definitely get it checked,” advises Debbie G, a runner diagnosed with a peroneal tendon injury. “I suffered for two weeks and feel so much better. Try to find a doctor that is familiar with runners,” she adds. If you live in the NYC area, contact us for peroneal tendon treatment.